Home recording was first launched in 1990’s and that’s when the earliest versions of the current DAW began. Ever since, people have never been so sure which one of the many Digital Audio Workstations works best. If you are just a beginner trying to figure out the best DAW software to buy, this article is designed for you. 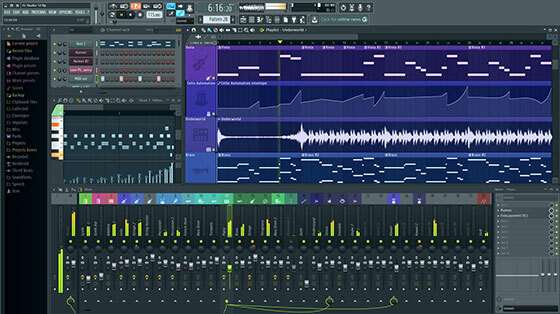 It is about the best DAW software for Windows 2018 and the one we like the most tops this list. Free Audio Editor is the best DAW software if you want to digitize sound recordings of vinyl LPs, video clips, DVD movies, music cassette tapes and online live streaming among others. It entails a timer and input level-triggered recording and a button to activate the Windows Mixer without necessarily going to the Control Panel. Here are the steps you need to do to record successfully and edit the recording with Free Audio Editor. Launch Free Audio Editor, the best DAW software, and then click Home, and then New Record. 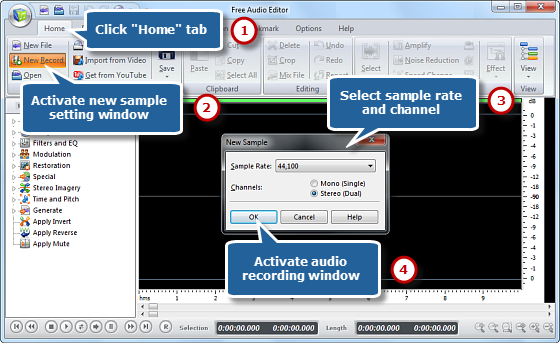 This will let you choose the recorder’s sample rate and channel before clicking OK to open the audio recorder window. 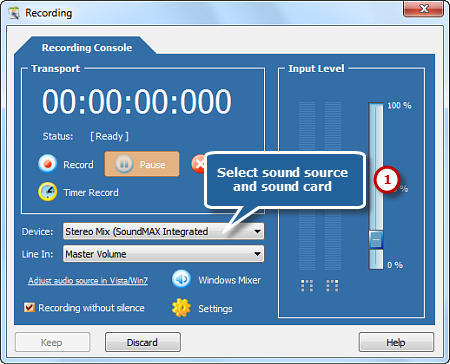 First select a fit sound card and then the sound sources in your operating system. These could be Aux Volume, CD audio, Mic Volume and so on. Picking the right source is vital, as it would make it possible for the audio signal to be detected. Play the audio file you wish to record and wait for the wave variations in a wave pattern to occur. 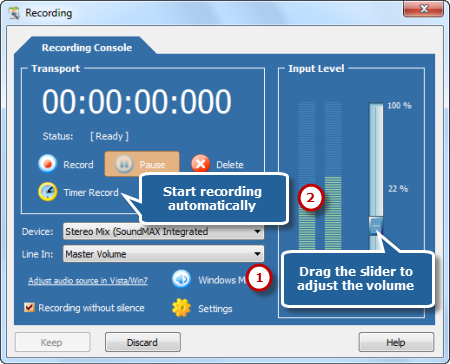 Drag slider to control the recording volume and click Timer Record to specify time and begin recording. Ensure that the volume is neither too low nor too high so the sound is not clipped off. Click the red round record button to launch the process. Pause to stop and click Keep to enter the recording to the waveform window. 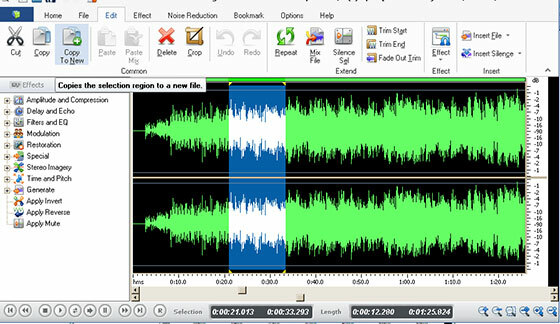 Before saving or storing your recording, edit it using Free Audio Editor’S effects. And to save it, click “Home” tab and then “Save” button to record the edits you’ve just done. To start recording with a new file name, click “Save File As”. Then, choose the output folder, format and modify the output quality. Listen to the new record! As for editing function, Free Audio Editor is still the best pick. 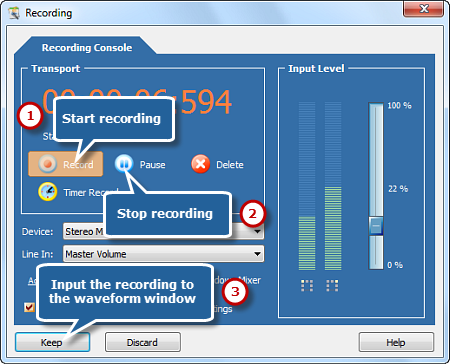 Click “Keep” and the recording will be directly input to the waveform workspace. Choose the part you want to edit by dragging the cursor on the waveform. Click “Edit” tab to start the process. Use various editing functions such as cut, copy, redo/undo, delete and so on. If needed, go to “Effects” tab to add some artistic audio effects to your recording. Go back to the “Home” tab and hit “Save”. This will help you store all the changes to your first recording file. If you want to use a different file name or location to save, click “Save File As”. If you want to save only the part you choose to an audio file, click “Save Selection As”. 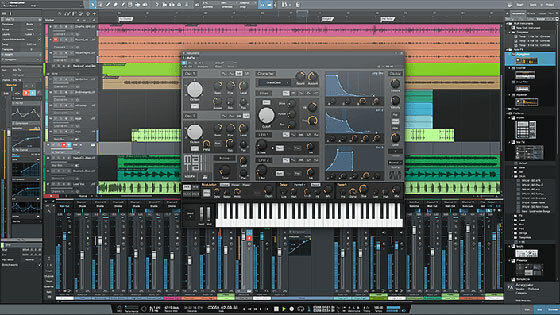 Presonus DAW line is quite young, although the company itself is famous for creating the best quality and affordable hardware. 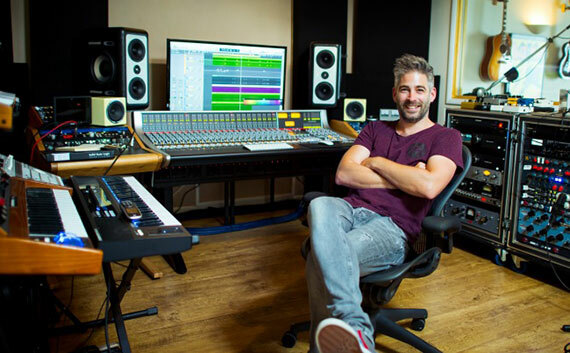 In alliance with many developers from Steinberg Cubase, Presonus came up with its first version of Studio about eight years ago. You have three options: Studio One Prime (free for downloading), Studio One Artist and Studio One Professional. Note that Studio One Artist can be yours for free if you pick these 3 interfaces: PreSonus Audio Box USB, Presonus AudioBox 22VSL and Presonus Audiobox 44VSL. First, FL Studio was called Fruity Loops. This changed when an Image-Line was developed and officially altered the former name of the software. This DAW is famous because of showing a spreadsheet-like playlist, a flexible piano roll and extensive automation capabilities. Among all DAWs, this is the only one that will offer you free lifetime updates. You can opt to buy Fruity, Producer or Signature bundle based on your ability to pay for them. Your Fruity Edition lacks an audio recording, so you might want to leave it out unless you only make electronic tunes. There is now an FL studio Mobile that is cool for a mobile user. This one was first designed as an instrument for live performers. It has ever since evolved into a total recording package that includes a visual interface that fits well on a single laptop screen. The most popular products include Ableton Push 2(w/Live 9 Intro), Novation Launchpad and Akai Professional APC Mini. These are third-party hardware controllers made for the software. Do you need a live performance tool, select the company’s live versions like: Ableton Live 9 INTRO, Ableton Live 9 STANDARD or Ableton Live 9 SUITE. The earliest version of Cubase got launched in 1989 and it was a MIDI edition. But in 1992, the company came up with two big software advancements. It added support for audio and Windows compatibility. Ever since, the company has continued to enhance its technology and has therefore made huge advancements to the music sector itself. 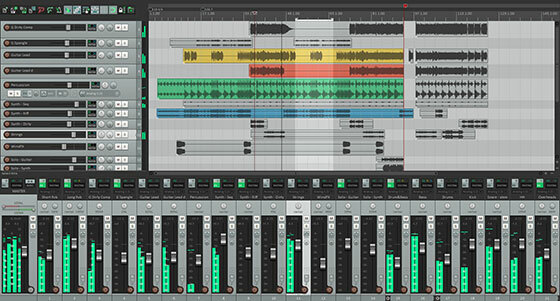 Up until now, Cubase has managed to keep its relevance for the decades it has been around. 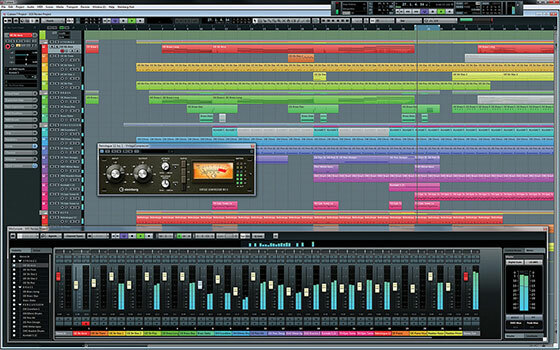 Steinberg Cubase Elements 9, Steinberg Cubase Pro 9 and Steinberg Cubase Artist 9 are the available versions for you. This is not your average DAW as it provides a great feature you will easily miss in a competitor product. 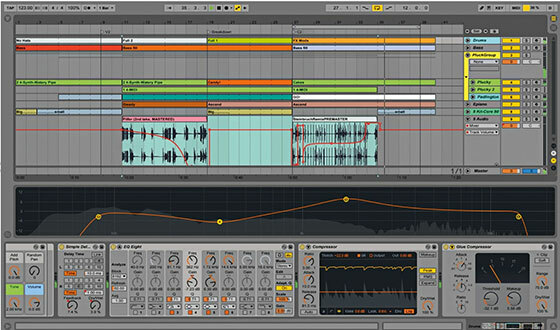 As well as being a standalone digital audio workstation, Propellerhead Reason acts as a group of virtual instruments that you could use together with other types of DAW. It has a nice interface that mimics the design of a real studio rack, permitting a rear access for cable patching. Pick this item if you love virtual instruments. 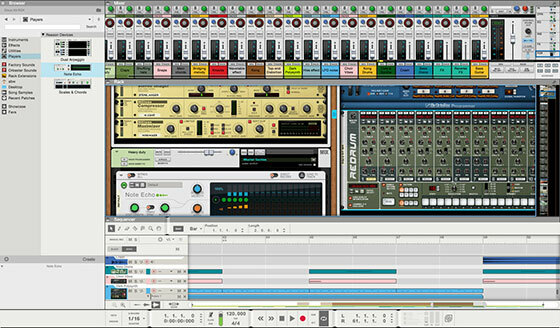 Available picks are Reason9 Essentials and Reason9 full. Currently, Avid Pro Tools is one of the most popular companies. It leads in the field of music recording and everyone uses it, explaining why pro studios, home studios and other entities use it. While Pro Tools has haters and is not great for everybody, you can pick it if this is your first DAW tool. It is desirable for beginners who don’t know what to use first and it is available in three versions: Pro Tools First, Pro Tools 12 and Pro Tools HD 12. The beginner version is the Pro Tools First and it is free of charge and downloadable. So you have nothing to lose by trying it. 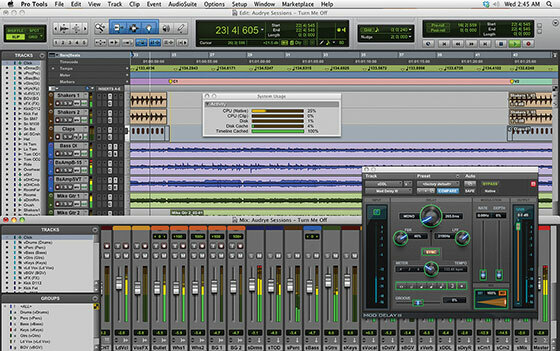 Pro Tools 12 is proper for intermediate users while Pro Tools HD12 is designed for professionals. It is a part of an HD Core System. Reaper or Rapid Environment for Audio Prototyping and Efficient Recording is the brainchild of Cockos Incorporated. Reaper is special because it managed to become so popular without creating a big advertising budget. Through enthusiastic users who liked its product, Reaper became really famous. Besides its so regular update releases, Reaper has a great price structure. Now they offer a downloadable free version of their software for 2 months after which you should buy a license for sixty dollars. You can get a more expensive (225 dollars) commercial license too for business use. Compared to most DAW listed above, Reaper is way cheaper. Now that you know the best DAW software for windows 2018, it’s up to you to pick the one you like the most according to your related experience.